The 2018 Tour de France route was recently announced. 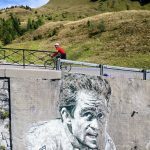 Every year, Tour organiser ASO runs a cyclo-sportive, open to all, that rides one of the Tour’s mountain stages a few days before the pros. 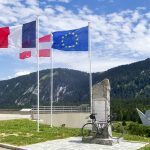 This year the Etape will replicate Stage 10 of the 2018 Tour de France. On the north edge of the French Alps, the 169-kilometre route reportedly has over 4000 metres of vertical ascent (I think it’s less). There is a detailed map of the route at the bottom of this post. To register see the official site here. This course should have a warning. 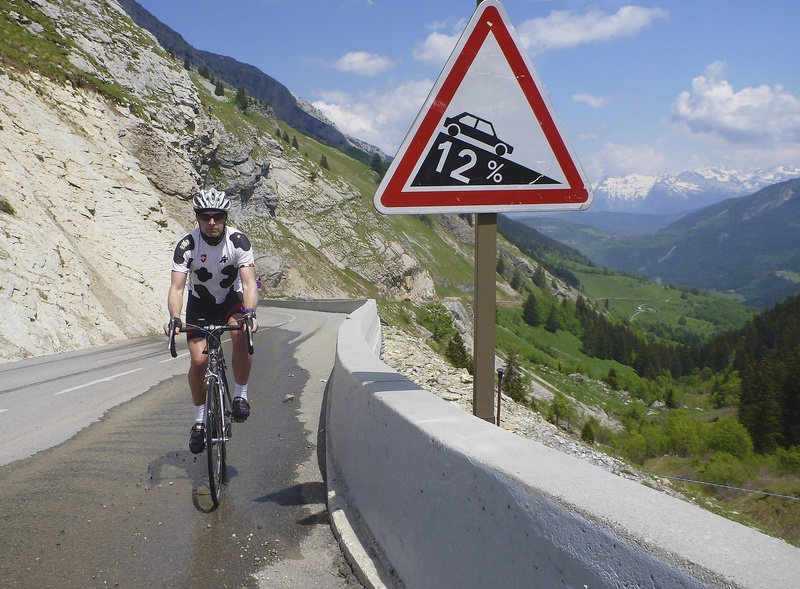 There are more hyper-steep kilometres than I can think of in any major sportive. There will be riders walking certain stretches. Tough. There is a touch of gravel. It’s only 1.8 kilometres and not too bumpy. But a fun innovation. 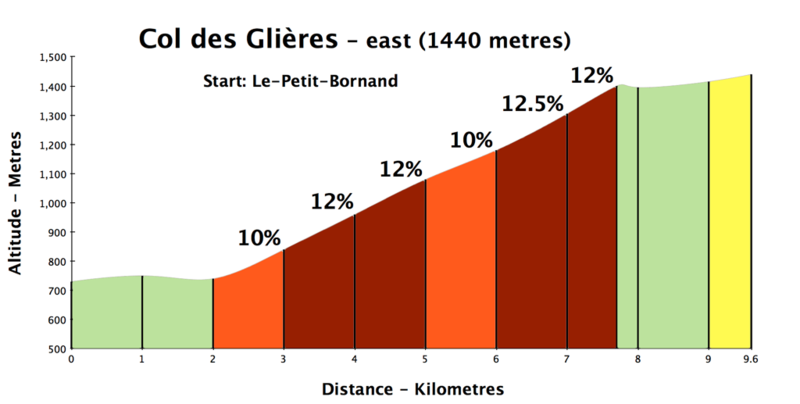 Plateau des Glières is the “new” climb this year to be introduced to the masses. Fantastic. Beautiful, and full of history. More below. It’s not the highest route, the high point being Col de la Colombière (1613 metres). The route starts in Annecy, with the first 25 kilometres running around 3/4’s of the beautiful lake. 25+ flat kilometres to wake the legs up. Useful. If you are riding the start on any day other than the race. Avoid the road on the west side of Lake Annecy. Very busy. And instead, take the dedicated cycle path that runs parallel. Much nicer. 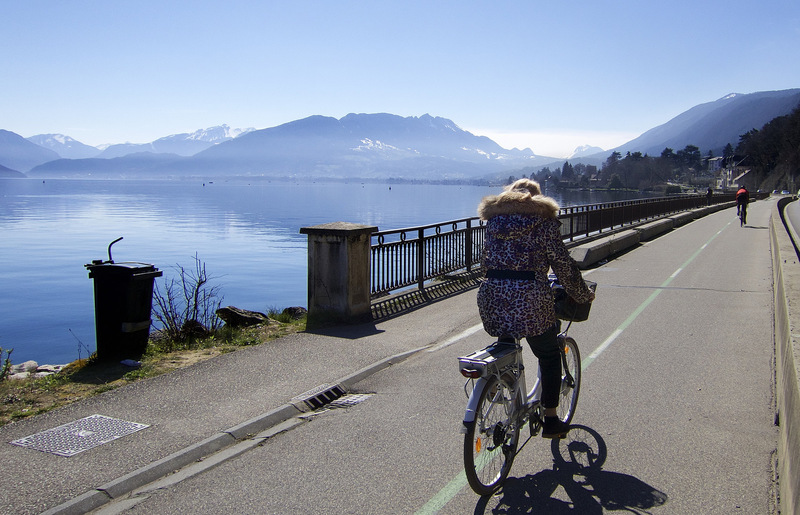 Annecy bike path. Nice kit! Leaving the lake, the first climb of the day is also the easiest: Just over 2 kilometres at roughly 7% to Col de Bluffy (630 metres). Next is another easy stretch to Thônes and then the fun begins. Good luck. 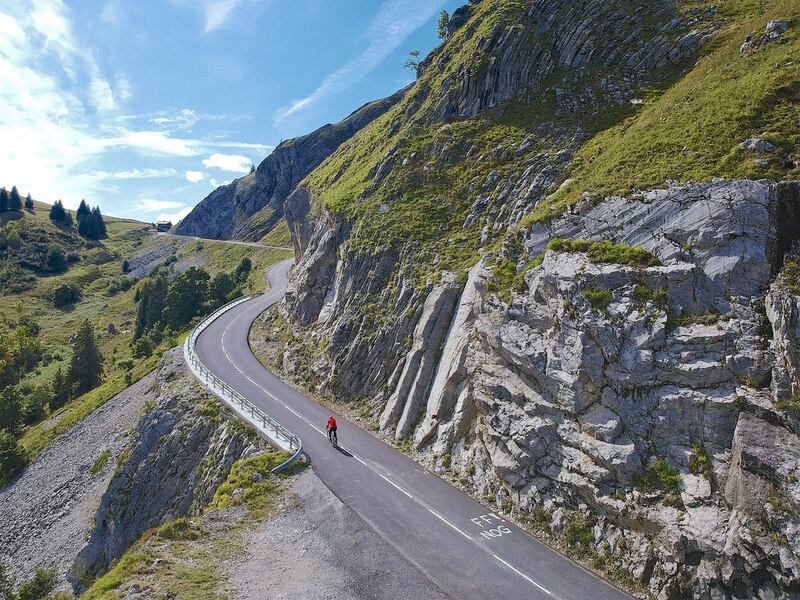 If you’re staying in the area, see here for the 10 best climbs from Lake Annecy. After 40+ kilometres, it’s the first real climb of the day. Col de la Croix Fry is one of my very favourite winter climbs. It’s dominated by L’Etale (2482 metres). Beautiful. The toughest stretch is halfway up, above the village of Manigod. 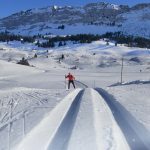 At the summit is good cross-country skiing (Plateau Beauregard), and downhill skiing (Aravis Alps). 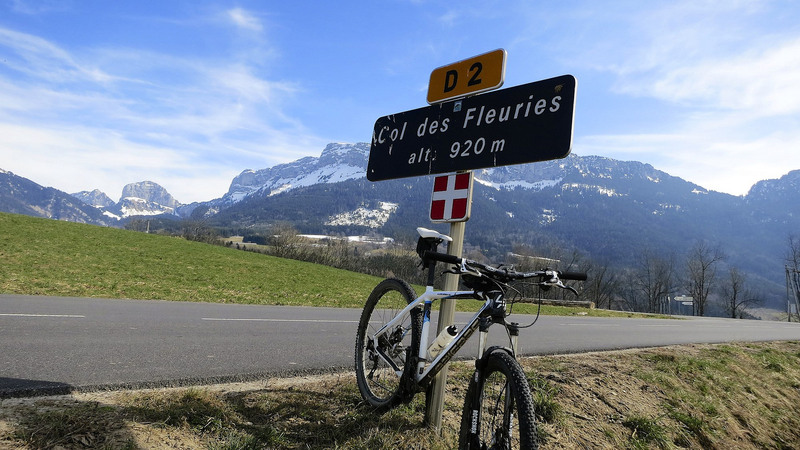 If just visiting, the best way to climb Croix Fry is via Col de Plan-Bois. After the fabulous Plan-Bois, the route joins Croix Fry at Manigod, enjoying its best top half. See here. It’s a long descent from Croix Fry, more than 20 kilometres, to the start of Plateau des Glières. For the col-hunters in the crowd, the route descends past Col de St-Jean de Sixt (956 metres). See map above. This is exciting. I have written in a few places (eg. 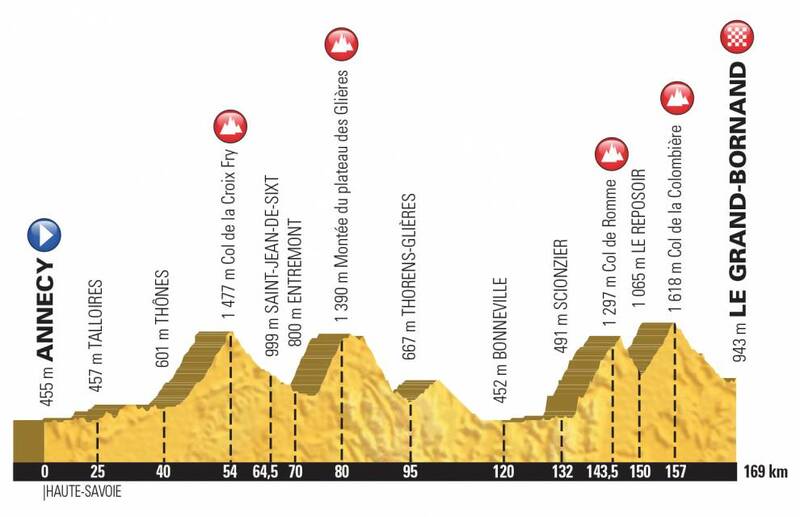 here, and here) that Plateau des Glières was one of the most worthy climbs in France to never appear in the Tour. After the steep stuff, it’s 1.8 kms of gravel until the summit. I’ve ridden it with a road bike. It is uphill, but only slightly, and not too rough. Lovely. During WW2, this plateau was generally inaccessible in winter and the Maquis (French Resistance) used it as a base and for weapon drops from the English. It was the site of one of the biggest battles between the Nazis and the Maquis, with 149 of the French resistance killed in March 1944 (more here). There is a museum, an informative signed walk, and the Monument National de la Resistance. While a perfect spot for a Tour summit finish, this is not a big resort (€€’s). But In winter, there is fabulous cross-country skiing here. One of my favourite locations. Tip: Mountain bike up, and rent XC skis at the summit. 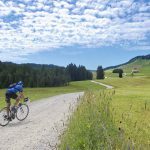 Here are details of five routes up to Plateau des Glières including the two paved routes that the Tour will climb then descend. And then some super-fun, unpaved options. 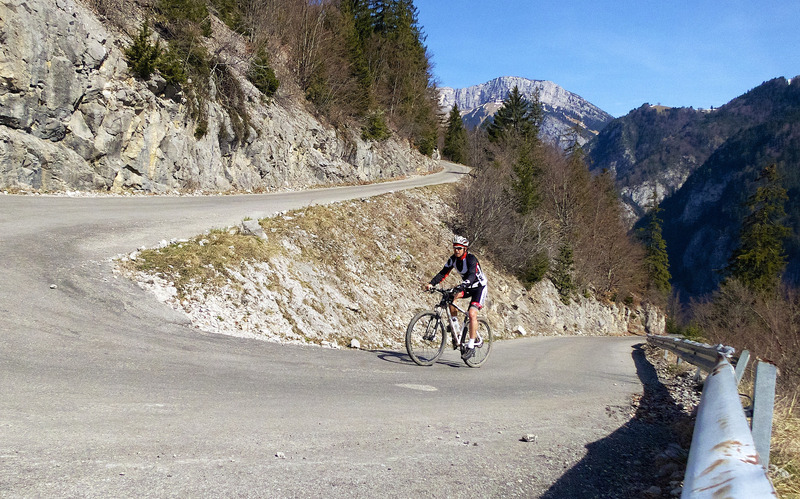 After a hairpin-filled, tricky descent of Glières is the peaceful, easy climb to Col des Fleuries. 5.6 kms @ 4.5%. From Fleuries, it’s a long traverse to the start of Col de la Colombière. It’s not the greatest stretch. Fine, but some traffic. 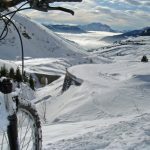 If riding on your own, consider (tougher) alternatives via Plateau d’Andey, or Mont-Saxonnex. This stretch passes the super-steep (and quiet) climb to Plateau de Solaison that appeared in the 2017 Critérium Dauphiné. I think it’s a possibility that Solaison could make its Tour debut soon. Details of climb here. This is an alternate, far tougher, way up the north side of Col de la Colombière. 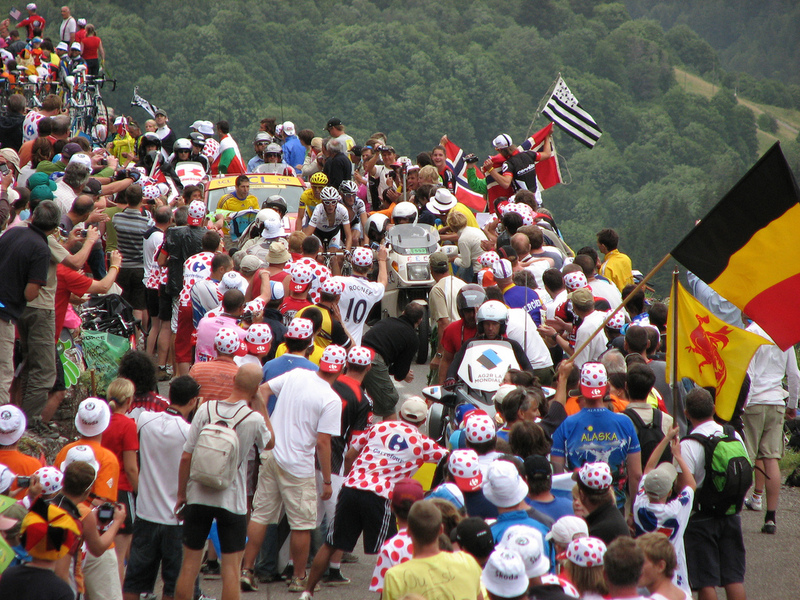 While Colombière is a frequent Tour climb, via Romme has only been used one – in 2009, stage 17. I met Didi the devil on the lower slopes of Romme that day. I show this photo only so you can see the towel. The climb to Romme is steadily steep. Consistently either side of 10%. Not easy. We’re almost there. It’s only 12 kilometres to the finish. Plenty of hairpins, but a wide enough road and not too steep. But my advice? 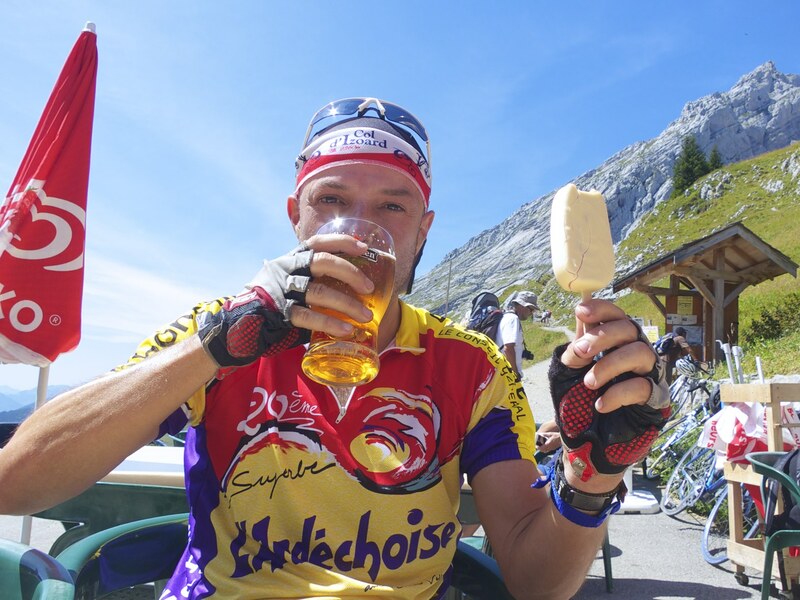 I’d stop at the nice restaurant at the Col for some well-earned refreshment. Best of luck to everyone riding this challenging but fun event. Thanks Will! 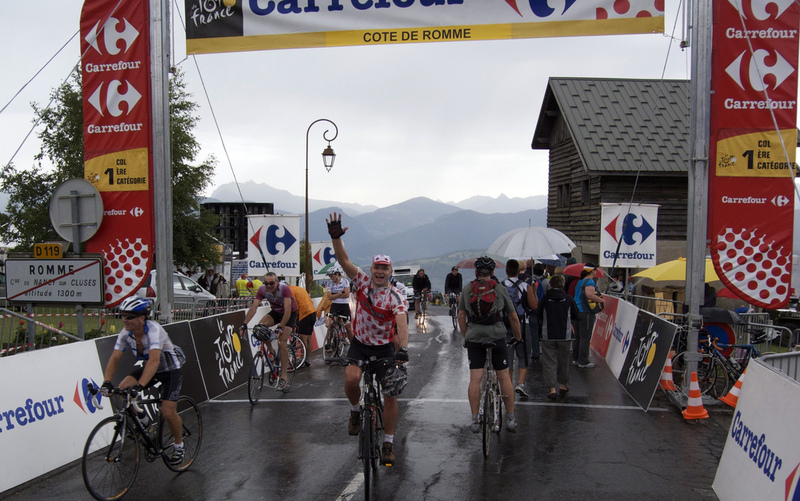 Great motivational pictures for those of us who entered the Etape in a rush of enthusiasm the day the site opened and then found all the arrows on the map. Thank you very much for sharing part of you life with us…! 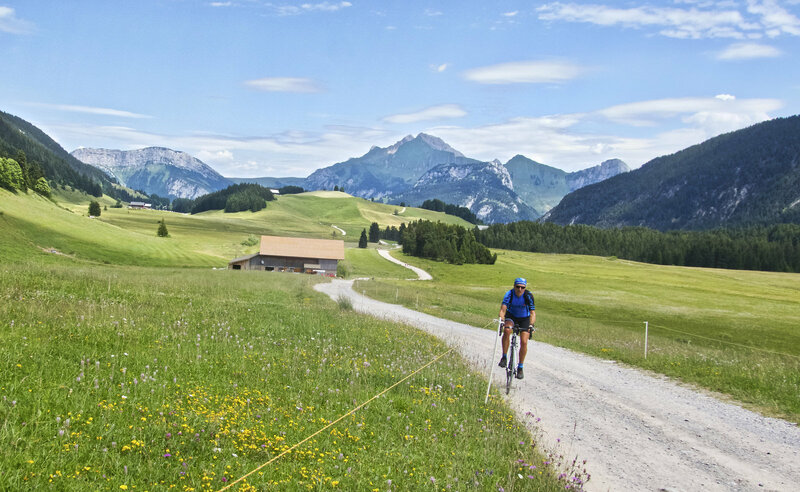 From what you experienced from all these years in the Alps, what would be the best time of the year to visit it for a nice road bike tour? I’m planning a self guided tour for 2019 and I was wondering what the weather would be like in the Alp before/after the summer season? June is a great time. Usually, the weather is good and the roads have less tourists. May can be too soon, depending on the climbs. 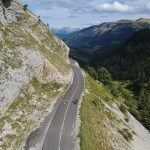 The highest roads in the Alps usually open early June. 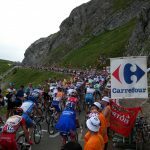 All the climbs in this article? Croix Fry is generally open through winter. Glieres is open in winter but the gravel traverse is snow covered. Colombier usually opens either side of the beginning of May.